My thoughts and ramblings about the Philippines, life, old memories and whatever else I feel like saying. 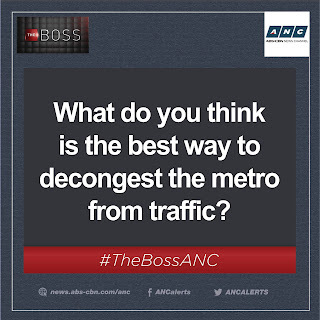 The Facebook page of ANC 24/7 is asking for its reader's suggestion on how to solve Metro Manila's traffic problem. This got me thinking, "what is the best way to solve Metro Manila's traffic problem?" It's easy to make suggestions, what's hard is the implementation and the cost of implementation. So what is the the best way to solve Metro Manila's traffic problem and the most cost effective solution? First of all, any implementation will definitely cost money, a lot of money. The cause of the traffic mess is the people themselves so it's only right that those causing the traffic problem should be fined and the fine should hurt. That way, the fines will pay for the cost of enforcing the law. This video shows that Bonifacio Global City (BGC) guards arresting two British Nationals. According to the report, the 2 Englishmen (Sam and Chris) where skateboarding along Fifth Avenue when two lady policewomen instructed them nicely that they could not skate there and told them to do it at the park, which they did. According to the Englismen, while at the park, a lady marshal shown on 1:16 of the video stopped them rudely. They explained to the marshal that the policewomen told them they can skate there. The marshal called for backup and confiscated their skateboard. One of the Englishman (Sam) said he got scared and ran off. The marshals successfully caught him as shown in the video. With only 28.5 seconds left in the game, a bench-clearing brawl broke out in this afternoon's Mapua Cardinals vs. EAC Generals game. With each team having only one player available after the brawl, NCAA officials decided to end the game and award the win to EAC. Final score: 86-77. Most of Metro Manila is underwater today with massive flooding caused by tropical storm "Mario". In what looks like a repeat of Typhoon Ondoy, some parts of Metro Manila is under waist deep water or higher. Here are some photos of the flood that I found. You ever read about the news about how our politicians are trying to stop crimes being by criminals riding on motorcycles? You know, the ones where they say that riding in tandem is going to be banned. And how they also want to ban motorcyclist from wearing helmets so they can't hide their identity. Well...what the hell do you want to call this? This photo was taken along Abad Santos where a man was spotted riding a motorcycle, in tandem, carrying an armalite. I guess they want to make a law banning riding in a motorcycle with an armalite next. An MRT train just derailed a few weeks ago and then this happened. Here's the description from the Youtube video. Sept. 2, 2014; around 8:40pm. I was about to go home from my internship in Makati when I rode this MRT train from Buendia Station. I thought it will operate just fine and safe. But this terrible thing happened. Another netizen posted this photo. More details at When in Manila. Vice President Jejomar Binay built a parking building for the city of Makati when he was the mayor. The building is now under investigation for being overpriced after being found to have cost P2.7B to build an 11 storey parking building. Senators Trillanes IV and Koko Pimentel III conducted and ocular inspection of the building on Monday, Sept 1, 2014. Obviously, the building is way overpriced. We can all understand if it is over budget, since most constructions do become over budget especially if it is done by the government. However, being over P1B over-budget (according to some estimates) is just outright robbery. When grilled during a Senate hearing committe, Mayor Junjun Binay said the reason for the price is because the Makati City Hall 2 is a world-class.